Premium pasta recipes originated from Italy for all occasions.Pasta with Tomatoes,Butter,Cheese,Mushrooms,Seafood,Meat,Olives and Olive Oil,Greens and Herbs,Beans,Lentils,Garlic,Peppers,Eggplant,Fresh and Filled. Always use fresh Italian Parmesan and always grate it freshly just before using. 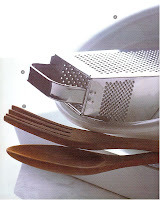 Grated Parmesan, however, is not an essential accompaniment to each and every pasta dish. In Italy, it is certainly never added indiscriminately. 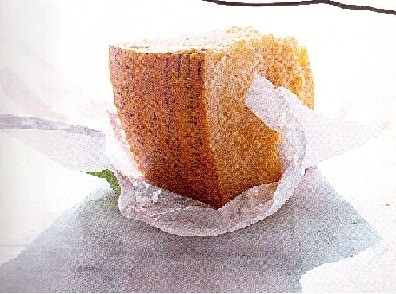 Parmesan is traditionally associated with richer and creamier sauces. Its addition would be considered heresy in many shellfish dishes, and it is even considered an optional extra on many olive oil based vegetable and tomato sauces. Speed is essential when saucing, tossing, and serving pasta. Have everything you need on hand. Make sure your family or guests are gathered at the table and ready to eat. • Don't delay! Sauce the pasta as soon as it has been drained. Pasta should never be allowed to sit in the colander without any sauce. Always have the sauce hot, ready, and waiting. • Sauce the pasta in a warmed serving bowl or in the still-warm pasta cooking pot. Even better is to add the pasta straight to the sauce in the skillet. Tossing everything together in the skillet in which the sauce was cooked provides a warm surface to ensure the pasta blends perfectly with the sauce. Use two large forks, or a large fork and a spoon, to toss the pasta.Mix well, until every strand or piece of pasta is lightly evenly coated with the sauce. If the pasta seems dry, drizzle in a little of the reserved pasta cooking water. The starch in the water helps the sauce to cling to the pasta and to coat every surface as uniformly as possible. Don't oversauce. The sauce should moisten, not drown, the It is not only the sauce that gives flavor to a pasta dish. The pasta has a taste and character of its own. You want the taste of the pasta as well as the sauce to come through. Pasta cools quickly, so have warmed serving dishes ready.Place an oven-proof serving bowl or individual dishes in a 250°F(120°C) oven to warm through while you cook the pasta. Or, just before serving, place in the sink and pour hot water. When the pasta is done, it must be drained immediately. Every second the pasta remains in the hot water it will continue to cook. • Be ready. Have your colander in the sink. As soon as the pasta is firm to the bite, tip it from the pot into the colander and give the colander two or three sharp shakes. • Don't overdrain. Draining pasta properly is important. Pasta should never be overdrained. It should remain slippery so that it can be properly coated with the sauce. 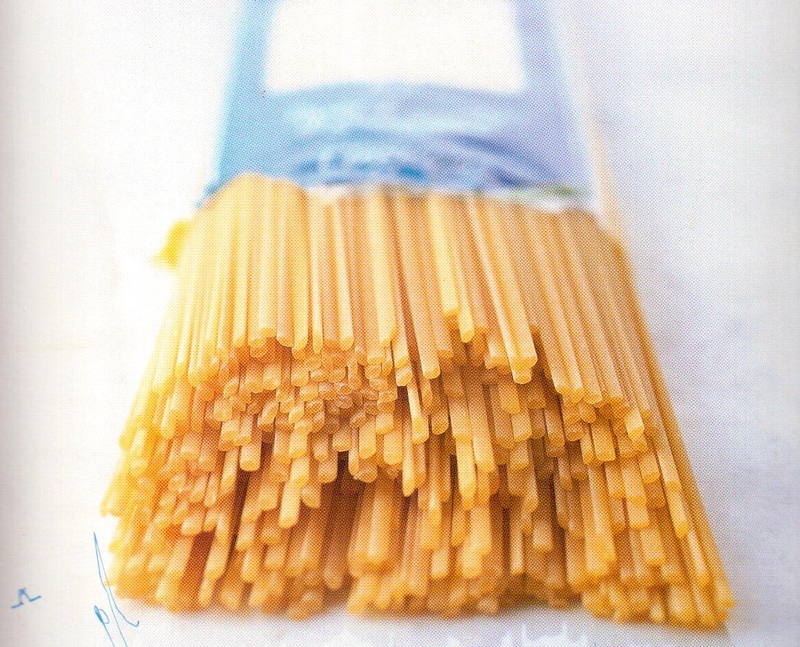 How well drained the pasta should be depends on the type of pasta and its shape. • Long pasta strands or ribbons should be left still lightly dripping with water. • Short pasta tubes or shapes should be drained more thoroughly as their hollows and holes will hold more water. • Fresh egg pasta needs the least thorough draining. It should remain very slippery with water after draining as it will tend to absorb more of the sauce than a plain dried pasta. When the recipe specifies, we suggest that you remove about half a cup of the pasta water from the pot and set it aside just before draining. Use the reserved water to adjust the consistency of the finished dish when it is needed. If the pasta is overdrained, if the sauce is too thick, or if the sauced pasta is too dry, add a few tablespoons of the reserved pasta water. Using th pasta water is always preferred to adding hot water from the tap as the cooking water contains the pasta starch and salt. This adds both body and seasoning as well as moisture to the finished pasta dish. As with all cooking and eating, the ideal point of doneness is always a matter of personal taste. As a general, pasta is perfectly cooked when it is tender but still retains some resistance - meaning you should still feel its texture when you bite into it. 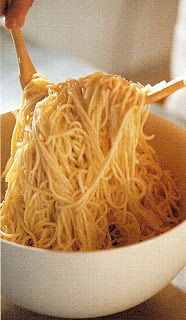 Al dente literally translates as "to the tooth", but "to the bite" is probably a more useful description. pasta will still have a chalky core a slight taste of raw flour. The pasta will have lost all its springy and chewy qualities. Uncooked fresh pasta is heavier because it contains more moisture than dried. Allow about 4oz (125g) for a first course serving, 5 oz (150g) for a main course serving. Don't skimp on the cooking water. The right proportion of water to pasta is even more critical in the case of fresh. Fresh pasta cooks in very little time, so make sure that the sauce is ready and the bowl warm before you slide the pasta into the water. 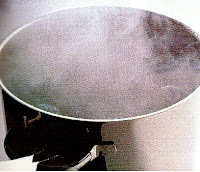 Once the water returns to the boil, begin testing for doneness after 1 minute. When To Add It ? When the water is salted and boiling, slide in the pasta all at once. All the pasta must be added at the same time to ensure that it cooks uniformly. 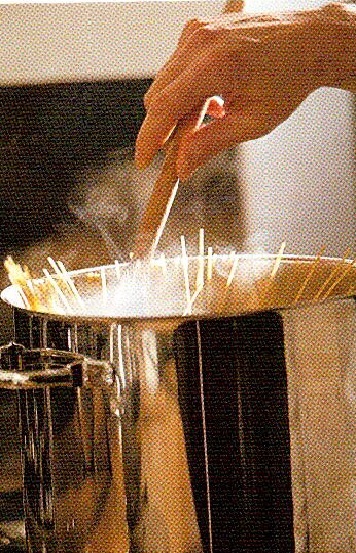 Stir immediately with a long wooden Cork or spoon to prevent the pasta from sticking to the bottom of the pot. 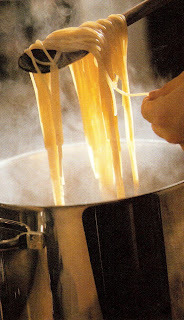 During cooking, stir occasionally to keep the pasta in constant motion. How Long To Cook It ? 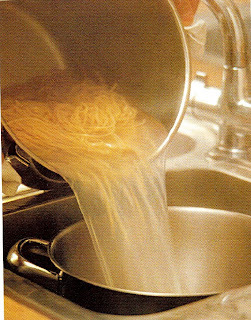 Always start timing from the moment the water returns to a rapid, rolling boil alter the pasta has been added to the pot. The actual cooking time will depend on the quality, size, and shape of the pasta. Use the timings printed on the packet only as a guide. The way to know when the pasta is cooked is to take some out and have a bite. We advise you to begin testing about 2 minutes before the packet instructions suggest it should be done. If you use the correct amount of water, add the pasta when the water is boiling rapidly, and remember to stir the pasta immediately, the addition of olive oil becomes totally unnecessary. It is in fact a waste of olive oil. The addition of salt to the pasta cooking water is an essential step that must not be omitted. When pasta is coocked in unsalted water no matter how flavorful the sauce, the dressed pasta will be certain to have a bland taste. 1. Use a coarse grain or flaked salt with no additives.Coarse or flaked salt will dissolve more quickly than a fine grain salt. 2. I always use coarse grain sea salt or kosher salt. 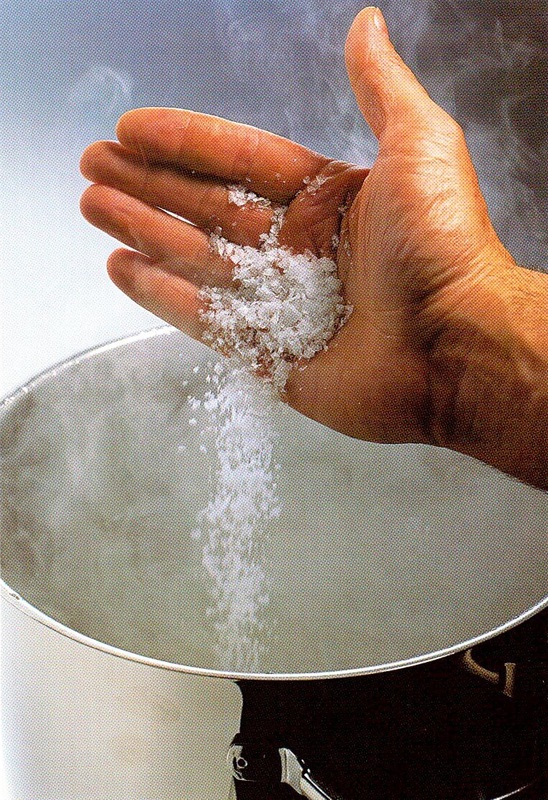 The quality of salt does matter, as different salts have different flavours and levels of saltiness. 3. Add salt to the boiling water 1 to 2 minutes before the pasta to give the salt time to dissolve. 4. 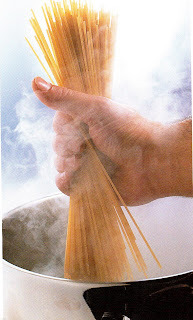 When cooking l lb (500g) dried pasta, add about 1 1/2 tbsp kosher salt to 4 to 5 litres (4 to 5 quarts) of boiling water. There is no rigid rule about how much pasta to cook. It all depends on whom you are feeding and what else you are feeding them. A traditional meal in Italy has no "main" course, it is rather a succession of harmonious courses of which pasta is usually one. Outside Italy, pasta is generally served as the main event, making a complete meal when paired with a crusty loaf of bread and a fresh green salad. A good rule of thumb is to allow about 2 1/2oz (75g) for a first course serving and 4oz (125g) for a main course serving. The recipes in this book will generally serve about 6 people as a starter and 4 people as a main course. When matching short pasta to sauce,be sure that the size of the pasta complements the size of the sauce ingredients.The chunkier the ingredients in the sauce, the larger the hollow or cup required to capture them. This is an important guideline to follow in order to allow a balanced mouthful of sauce and pasta to be enjoyed when the finished dish is eaten. 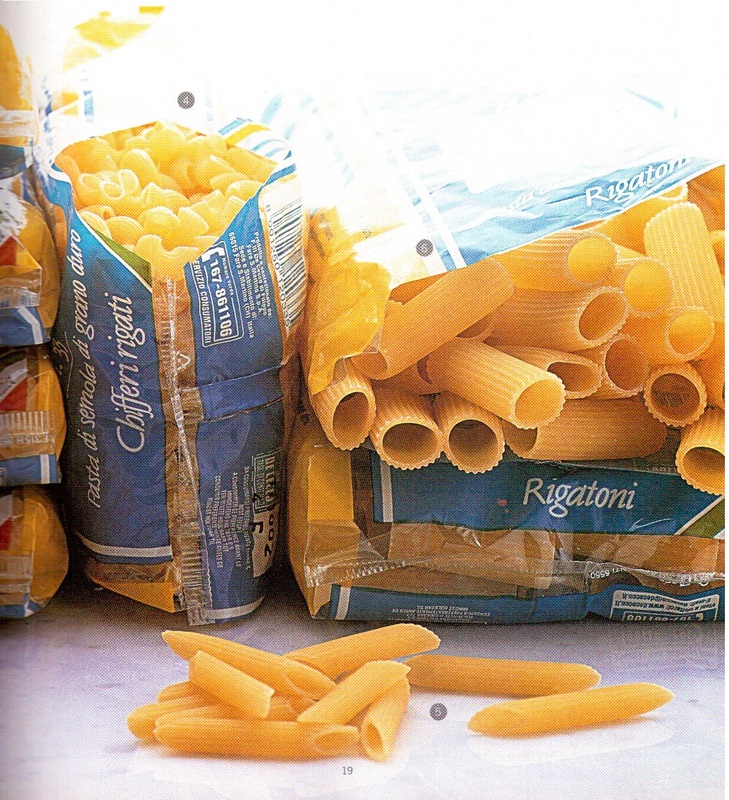 Pasta tubes and shells come in many different sizes. Large pasta tubes and shells are excellent paired with rich meat sauces, robust vegetable sauces, or used in baked dishes. Medium-sized short pasta tubes, shells, or shapes go well with vegetable sauces and are also good for pasta salads. Long and thin dried pasta ribbons and strands should be dressed with light, oil-based sauces which allow the strands to remain separate and slippery. 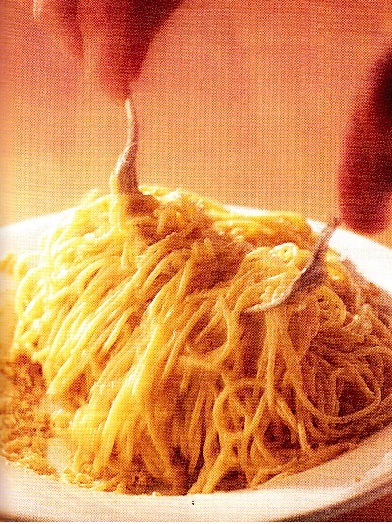 Strands and ribbons that are thicker, such as bucatini or tagliatelle, are best when paired with sauces based on cream, cheese, and eggs, or with sauces based on meat. Dried egg pasta ribbons, such as fettuccine and pappardelle, also pair well with these same types of sauces. A good guideline tor matching long pasta to sauce is whether the sauce ingredients will cling to the pasta when it is twirled on a fork. 6. Linguine - "Little Tongues" - Thin ribbons. 7. Spaghetti™ - "Little Spaghetti"
sauces are best paired with long pasta strands or ribbons. Short pasta shapes and tubes suit thicker or chunkier sauces that cling to the hollows of the pasta and get caught inside the holes. But remember, cooking and eating pasta is no different from all cooking and eating; whatever venerable traditions and classical rules there may be, always trust your own palate. At the end of the day, it's a matter of personal choice. There is only one important rule to remember when buying pasta. Good ingredients are essential tor good pasta. • Choose pasta made from one hundred per cent durum wheat. 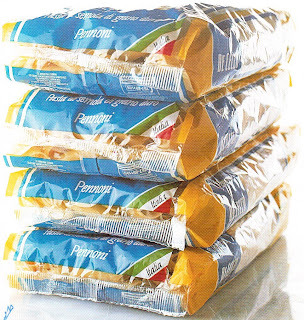 Always check that the packet reads either pasta di acnwla di grano duro or durum wheat pasta. Durum wheat is a hard wheat grain - in fact the hardest wheat grown. Pasta made with durum wheat will maintain its shape, texture, and flavor while cooking in rapidly boiling water. • Choose pasta made in Italy wherever possible. 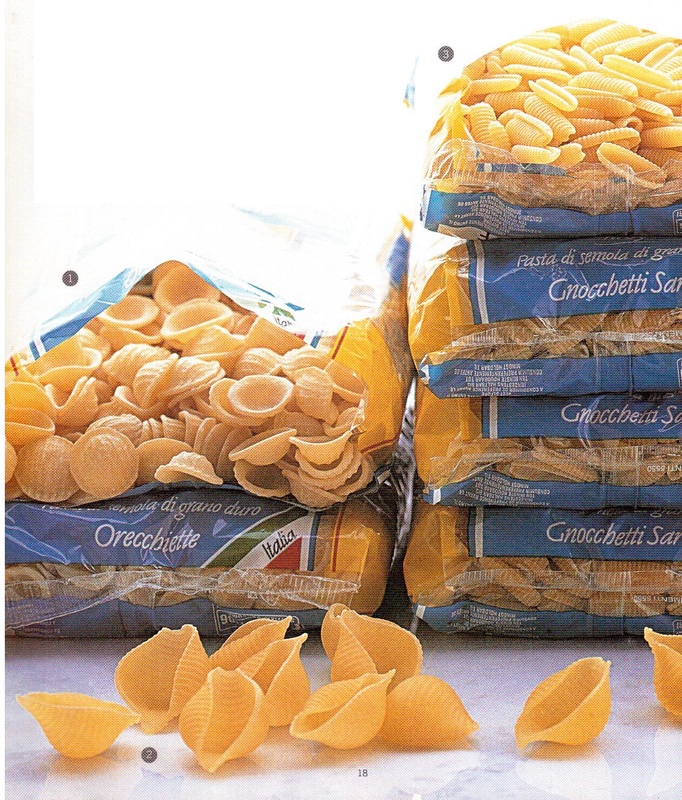 In Italy, both the composition and the manufacture of dried pasta are tightly controlled by law. Pasta produced in other countries can be made from ordinary soft wheat flours or from blends with durum wheat When cooked, pasta made from inferior types.of Hour will have a limp, sometimes gluey, texture as well as a tendency to overcook. Dried pasta divides into two types: pale yellow plain pasta made with durum wheat and water, and golden egg pasta made with durum wheat and wholes eggs.Egg pasta has a smoother, silkier texture: plain has a firm, chewy bite. Neither is superior to the other - they are simply different. 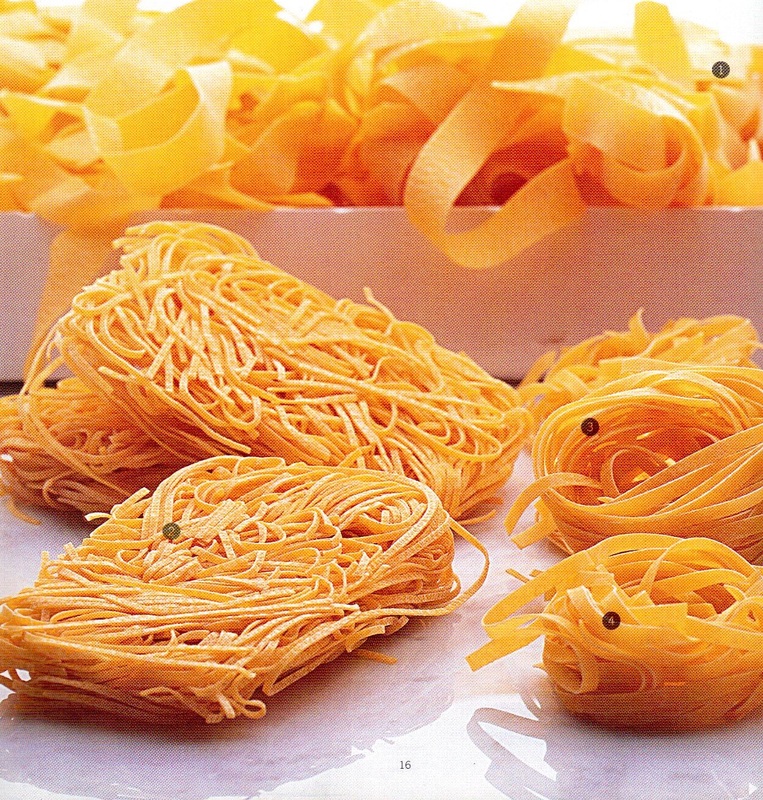 In Italy,it is the sauce that determines the choice between dried plain pasta and dried egg pasta. Oil-based sauces are usually served with plain pasta and butter-based and cream-based sauces with egg pasta. We still come across the widespread misconception that fresher is better. This is not so.Truly fresh pasta that is worth buying is made with good quality flour and real eggs and no other additives. Finding this can present a challenge. 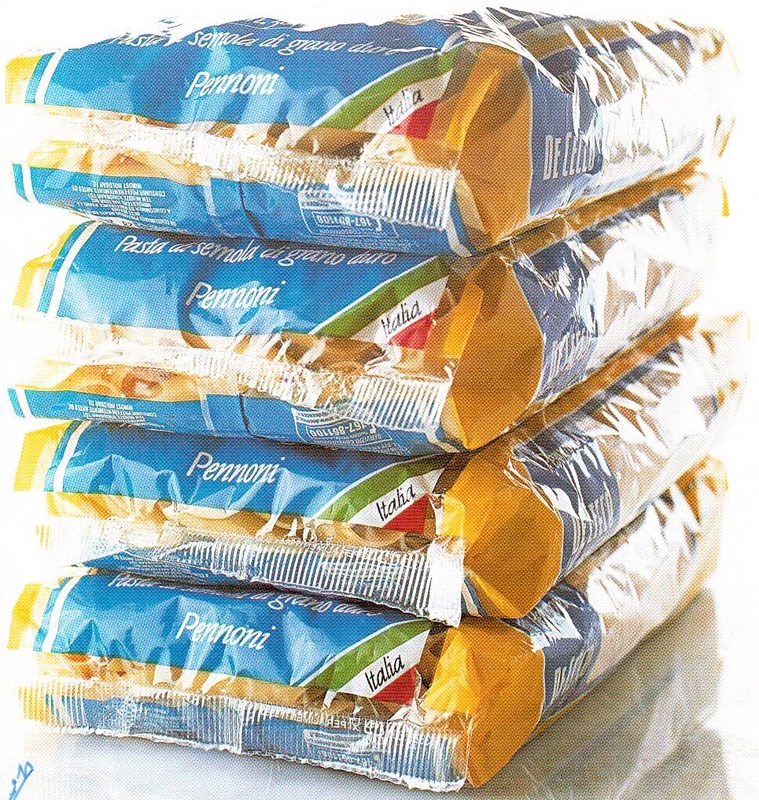 We will always choose quality boxed dried pasta imported from Italy over a pre-packaged fresh pasta from the supermarket. Homemade fresh egg pasta is another story.The finest fresh pasta is always made at home, using the best ingredients.For your enthusiasm I will tell you in my upcoming posts how to make a fresh egg homemade pasta. In an Italian home, pasta is always served from a large bowl set in the middle of the table. A wide bowl with shallow sloping sides is traditional. II the bowl is too deep the high sides will inhibit the tossing, and therefore the proper saucing, of the pasta. As soon as the pasta and its sauce are together, they must be tossed immediately. A large fork and spoon, or two forks, do the job best. Pasta is a simple food. The success of a pasta dish will owe much to the quality of its ingredients. In Italy, freshly ground black pepper and freshly grated cheese are basic necessities, making a cheese grater and a pepper grinder essential equipment, both in the kitchen and at the table. 2. Large fork and spoon for tossing. The key to making perfect pasta is to start with the right pot. When cooking 1lb (500g) dried pasta, the pot should hold about 5 quarts (5 litres) of water to give the pasta plenty ot room to move around. 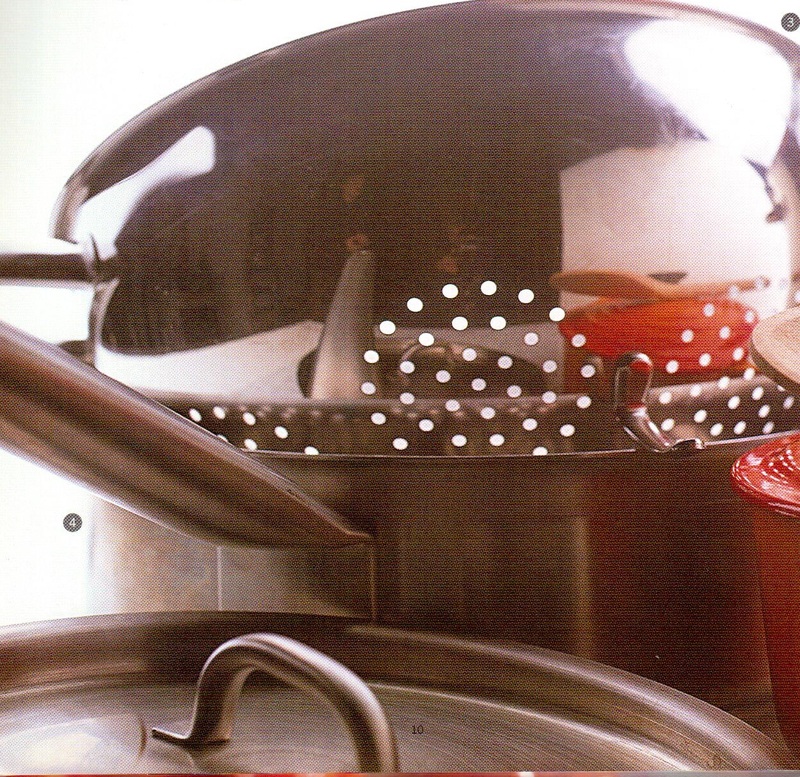 A pot made of an inexpensive, lightweight metal like aluminum is ideal, since it conducts heat evenly and is easy to lift when full ot boiling water. A stockpot will also make a good pasta pot, as it is usually taller than it is wide and has two sturdy handles for lifting. 1. Tall, narrow, lightweight pasta pot with a lid. 2. 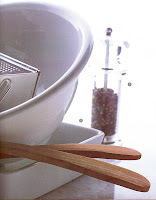 Long handled wooden spoon for stirring pasta. 3. Large colander with feet. 4. Large skillet for quick cook sauces. 5. 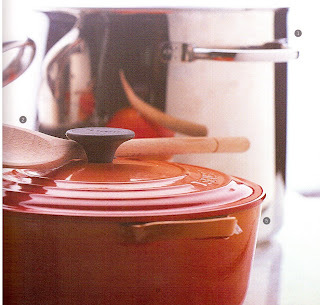 Heavy-based pot with a lid for slow cook sauces. Pasta is everyday food, yet any Italian knows that the cooking and serving of it calls for care and attention. Remember these ten golden rules for perfectly cooked pasta every time. 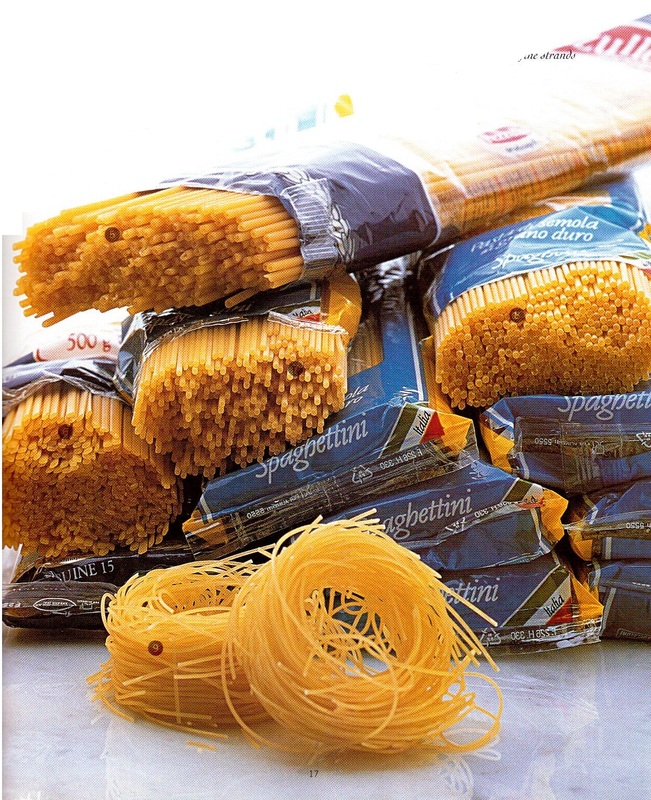 • Buy good quality Italian pasta. Use a large pot full of water. • Salt the water with a generous hand. • Boil the water and keep it boiling. • Stir the pasta often - it will stick if you don't! 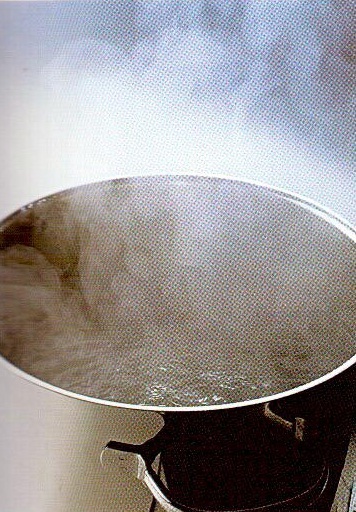 • Start timing when the water returns to the boil. • Don't wander often! As they say in Italy, gllspaghetti amano la compagnla - spaghetti loves company. • Drain immediately, but not too thoroughly. • Have the sauce and a warmed bowl ready. • Eat up! The only time people stop talking in Italy is when a bowl of pasta is placed on the table. BEFORE YOU COOK read through the recipe carefully- Make sure you have all the equipment and ingredients required. Always take cooking times as guideline rather than gospel. In each recipe, we qualify estimated cooking times with a description of how the ingredient should look at the end of cooking time, for instance "cook until soft, 5 minutes". It is better to cook the ingredient until its appearance matches the given description rather than simply setting the stopwatch. 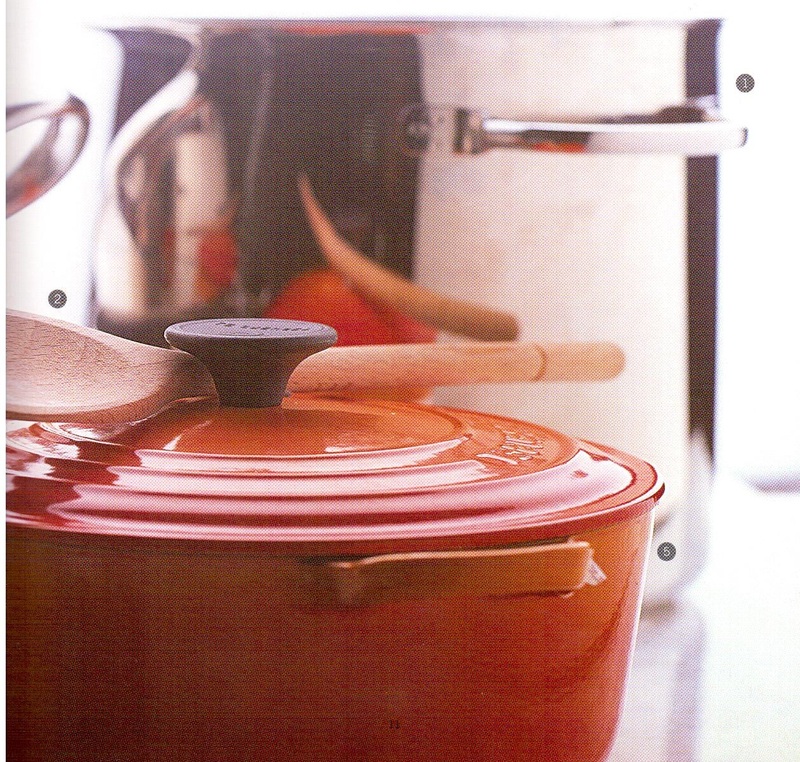 Various factors affect cooking times, with your choice of pan and the character of your oven at the top of the list. The size and shape of a pan directly affect how quickly a dish will cook. The same sauce cooked over the same heat will cook faster in a wide, shallow skillet and more slowly in a tall, deep pot. The larger cooking surface of a wide skillet ensures rapid evaporation, while the high sides of deep pots actually inhibit evaporation. 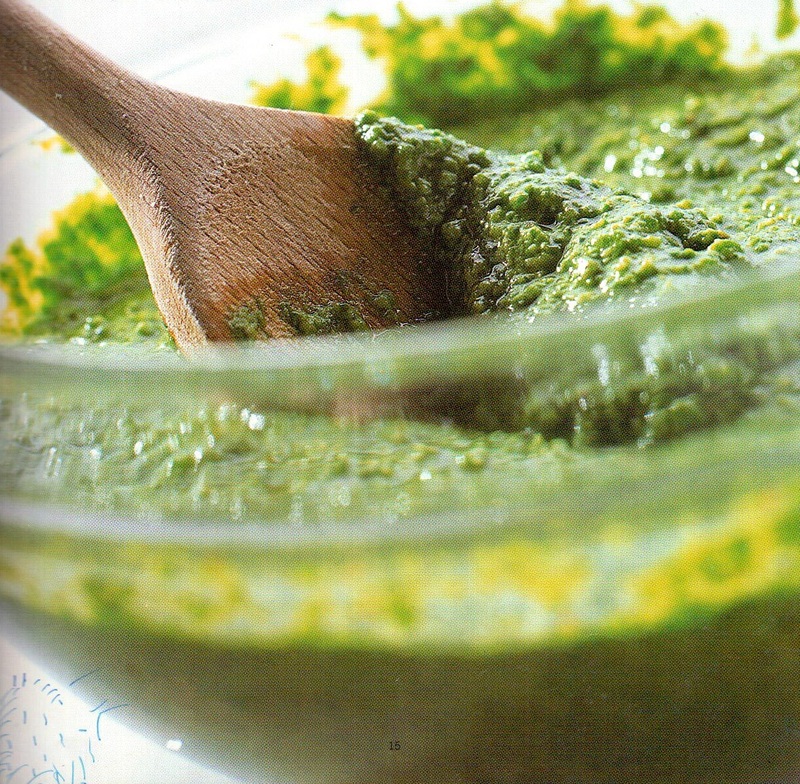 In each recipe, we have specified the size and shape of pan required for a quick cooking or slow cooking sauce. Ovens vary from kitchen to kitchen. Most have hot spots, so be prepared to rotate dishes from top to bottom or from front to back during cooking time. An oven thermometer is a useful kitchen tool, allowing you to match your oven's temperature with the one specified in the recipe. Always allow a margin of 5-10 minutes either way for baking times. Always taste food as you cook and before you serve. Don't be afraid to add or change flavors to suit your palate - the fun of cooking is in experimenting, improvising, creating. Ingredients differ from day to day, season to season, and kitchen to kitchen. Be prepared to adjust sweetness, sharpness, spiciness, and, most important of all, salt, to your own taste. Discerning seasoning makes the difference between good and great food. As a general rule, seasoning is best done toward the end of cooking. The optimum moment for a cook to judge how much salt and pepper a recipe requires is at the end of cooking lime, when the flavors have blended. Accurate measurements are essential if you want the same good results each time you follow a recipe. We have given measurements in imperial and metric in all the recipes. Always stick to one set of measurements. Never use both in the same recipe. A good set of measuring cups is the most accurate way to measure dry ingredients. We recommend using cooks' measuring spoons when following a recipe. All spoon measurements in the book are level unless otherwise stated. To measure dry ingredients with a spoon, scoop the ingredient lightly from the storage container, (hen level the surface with the edge of a straight-bladed knife. To measure liquids, choose a transparent glass or plastic measuring cup. Always place the cup on a flat surface and check for accuracy at eye level when pouring in a liquid to measure. A final and important rule of measuring - never measure ingredients over the mixing bowl! The Italians, who are masters at combining sophistication with simplicity, have eaten pasta for the past millennium or so. They know that no other food can nourish and delight so easily, while asking for so small an effort on the part of the cook. Simple yet sustaining, a dish of pasta satisfies our hunger yet invites the eye and pleases the palate with its countless shapes, colors, and flavors. It is the most versatile of foods, changing its character with ease, according to season, occasion, cook's mood, or time available. We concentrate mainly on dried pasta, which is the pasta that the Italians eat religiously and lovingly every day of every week. It is the pasta they always have on hand, and it is the pasta that pairs most successfully with the greatest number of different sauces. Some of the sauces I have chosen are classic, others are modern, and many are variations on a traditional theme. There are slow-simmered sauces that can be prepared totally ahead of time, as well as many quick-fix sauces that can be made just before eating, so a whole meal can be put together in half an hour or less. Put together, yes, but always with love, care, and attention. When the family is nearly ready to eat, the pasta is slid into a pan full of boiling water and the cook shouts Ho inej.wglii la pasta - I've put the pasta in. A few minutes later everyone sits down in silence and the cook brings in the bowl of steaming pasta and sets it in the middle of the table for people to serve themselves. Pasta is a convivial, sharing food; to our mind, it is best not formally plated. Dove c epasta, c'e dperanza Where there's pasta, there's hope. Pasta Feast copyright 2011 - 2012. Powered by Blogger.